The role of technology in teaching and learning is a hot topic. Every week, there’s a new batch of articles and blogs highlighting initiatives that leverage solutions to support personalized learning, learning spaces, and student-centered learning. Likewise, there has been a corresponding growth in the solutions purporting to help institutions with their various teaching and learning initiatives, as evidenced by our research on the Higher Education Technology Landscape. There has been, however, less emphasis on how institutions select the solutions to support these initiatives. As we noted in a previous post, we have noticed a change in how institutions approach technology selection. Many institutions have shifted from a sole focus on a solution’s features, functionality, feasibility of implementation, and cost—a product-level view—to balancing these considerations with a solution’s fit within an ecosystem or with broader organizational goals—a strategic view. Within the domain of teaching and learning, this strategic view often plays out in the arrangement of technology products and guiding principles underlying a teaching and learning ecosystem. For example, Georgia Tech developed a learning engagement ecosystem comprising three functional areas—content and activity management, engagement management, and learning management—based on the guiding principle of interoperability between the tools within the ecosystem. 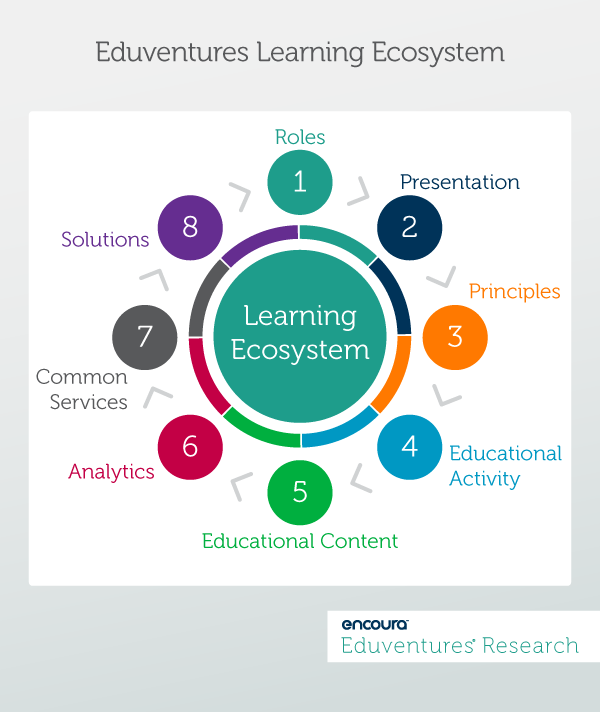 Another example that many schools use is Educause’s Next Generation Digital Learning Ecosystem, which identifies solutions such as learning management systems or adaptive learning and emphasizes essential principles such as interoperability, accessibility, collaboration, and personalization. As institutions look to develop ecosystems that are “future-proof” or address potential changes in areas such as an educational delivery (i.e., online, in-class, etc.) and educational activities (i.e., formal learning, informal learning, etc. ), this strategic view is essential. The current approaches to this strategic view, however, fall short. Because they tend to focus on solutions and principles, most current approaches overlook subtle, yet powerful shifts within teaching and learning in higher education. These shifts range from a change in the relationship between learners and educators, to the services that support teaching and learning initiatives. Focusing on solutions alone obfuscates how technology should respond to them. What we propose is a different way to develop a strategic view of a teaching and learning ecosystem, one that captures the component technologies and principles, while also identifying the shifts in teaching and learning. How does this approach work? At its core, our approach centers on a different definition of a teaching and learning ecosystem, one that extends beyond just the technology and principles to include the evolving interaction of faculty, staff, students, tools, and services (Figure 1). While most shifts in teaching and learning are happening within the educational activity and educational content components, other ecosystem components have also seen changes that impact technology selection. For example, as more institutions seek to strengthen student engagement in the learning experience by creating, storing, and sharing their content, specific solutions—such as learning management systems—have had to move away from their initial focus on the instructor role to also build out student interfaces. Likewise, the guiding principles at some institutions are shifting to include considerations about whether a solution is reusable for more than one purpose or whether it can serve as a platform on which other applications can exist. In our upcoming research on student success, we will view the solutions in our landscape through the lens of this strategic view of the ecosystem. We hope that we will clarify and surface the key decision-points institutions need to consider when constructing their learning ecosystems. We will also highlight how different solution types support each component to help institutions see beyond the chaotic market. CHLOE 3: Behind the Numbers is the third in a series of annual reports based on a survey of chief online officers from all sectors of U.S. higher education. In its third year, the annual CHLOE survey grew to 280 chief online officer responses from 182 in the previous survey – a 54% increase – further expanding the range and variety of institutional responses and increasing the representativeness of the results. As online learning continues to increase in scale and scope in higher education, CHLOE shines a light on the strategic and operational side of online learning, helping leaders and practitioners better understand trends and developments. Presented by Richard Garrett, Eduventures Chief Research Officer, ACT | NRCCUA and Ronald Legon, Executive Director Emeritus, Quality Matters, the webinar will discuss enrollment trends, the typical structure of online courses, institutional governance practices for online programs, and analysis of online quality assurance as a process. How Do Institutions Select Retention Management Technologies?